Charlie Wilson, an alcoholic womanizer and Texas congressman, persuaded the CIA to train and arm resistance fighters in Afghanistan to fend off the Soviet Union. With the help of rogue CIA agent, Gust Avrakotos, the two men supplied money, training and a team of military experts that turned the ill-equipped Afghan freedom-fighters into a force that brought the Red Army to a stalemate. However, the result also empowered the Taliban and terrorists including Osama bin Laden. 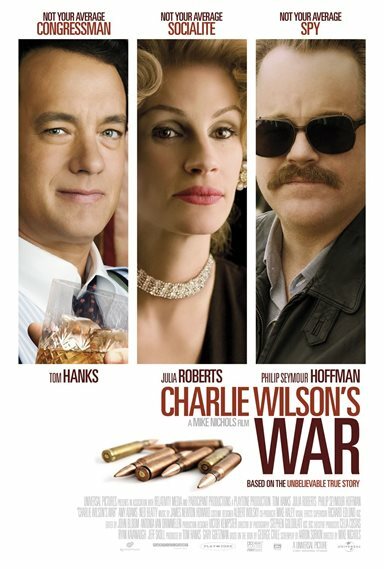 Download Charlie Wilson's War in Digital HD from the iTunes store. Charlie Wilson's War images are © Universal Pictures. All Rights Reserved. It's fashionable today to talk about how "we" created the Taliban--our own present-day Frankenstein-Monster come back to haunt us. It's less common to hear people discuss the context in which we handed out state-of-the-art Stinger missiles to a bunch of religious fanatics. That context was the cold-war and mutually assured destruction. When the Berlin Wall fell, I remember a sense of utter astonishment: I'd expected "the Evil Empire" to exist forever. I'd read science fiction books that had a soviet space-entity existing into the far, far future. Rather than seeming naive or simply allegorical, I, growing up in the 70's, regarded it as a fact of nature. It wasn't: the Soviet empire collapsed--in part because of an un-winnable war in Afghanistan. That war, it seems, was "un-winnable" because of a billion dollars of material support given to the mujahideen by the US (funneled carefully through Israel and then Pakistan and Egypt). I actually did know something about that: one of the scariest things in the potential Taliban arsenal are those Stinger missiles that kill soviet helicopters as reliably as a pool-shark making a break shot. If those ever get trained on civilian jet-liners, we're screwed (thankfully the word is that they don't last forever. They go bad!). In Charlie Wilson's War we are told the story of a real-life congressman who took it on himself (with the help of civilian funding and some CIA operatives who didn't really have much of a mandate) to "bloody" the Soviet army. 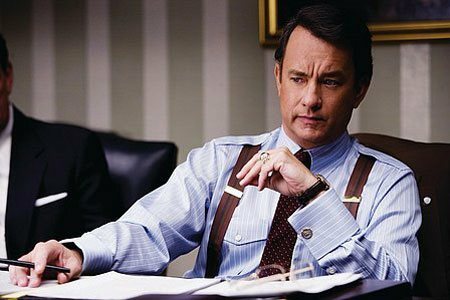 Charlie is played by Tom Hanks and his right-wing, fundamentalist backer Joanne Herring is played by Julia Roberts. The movie is written by Aaron Sorkin (The West Wing) so it has the political vibe down. Unusually for a historical movie, all the principals are alive, agreed with what's in the film, and seem to have the cards on the table: I'm pretty sure that it didn't really happen the way the movie says it does--but clearly some of it (Wilson receiving a stinger missile tube from the Afghanis) did occur (Wilson says it's in his home in a place of honor. As a political movie it is an unusual artifact. It's hard to classify as purely right-wing: Herring isn't especially likable as a hypocrite: she calls Charlie's Angles (three beautiful office attendants) sluts while she, herself, cheats on her husband with Wilson. Charlie is accused of doing cocaine by an overzealous prosecutor named Rudy Guiliani. Charlie may be a man of substance in some respects (patriotism, intelligence) but he's got, to put it mildly, many, many bad habits. He's also a Democrat. In the movie the Soviets are portrayed as, well, pretty bad--although we don't see much of them. The refugees are portrayed as suffering horribly (true), and Pakistan gets, I think, decent treatment all around although the guy did have his former leader executed in a military coup. With so many imperfect protagonists about the only thing the movie can agree on is that the fall of the USSR was good, Charlie really helped with it, and after spending a billion dollars on guns we refused to spend a million on schools (hello Taliban). What makes a movie like this worth watching isn't the history though--it's the performances. Here it really shines. 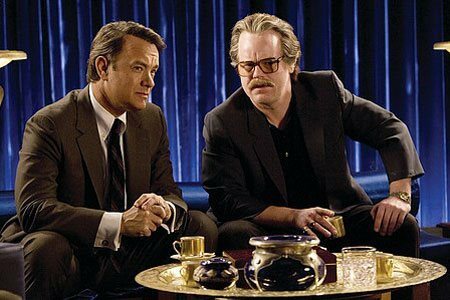 The dialog is snappy (Sorkin), Wilson is charismatic no matter how questionable his ethics around drugs and alcohol and women, and Philip Seymour Hoffman as CIA operative Gust Avrakotos would steal the show if Hanks wasn't a magician at what he does. The way the characters work towards their goals and the movie watches them is high energy, fast moving, and seems effortless. In a decade of message movies (Lions for Lambs, Rendition, etc.) this is one where the "message" is kind of hard to tease out. I think we're all supposed to feel chastised by 9/11 for creating the monster that came after us--but in War it seems like the actual distribution of guns to those holy warriors--and, indeed, the warriors themselves, wasn't that bad compared to toys designed to maim children and skies filled with lethal helicopters hunting men for sport. It's interesting to see a movie with a sense of humor that takes on the larger context of a bunch of decisions made by people who might've been elected but saw themselves with a larger responsibility than one district or even one state. I remember when I heard the wall was coming down and now that I know that a guy named Charlie Wilson from Texas had a heavy role in that, I think it's fair to say that this is a story that while being told in a time of partisan politics and war would feel fairly at home any time after the fall of the soviets--it's probably more timeless than it is timely ... and with a bunch of political clunkers rolling off Hollywood's assembly line, I think we can be grateful for that. Charlie Wilson's War images © Universal Pictures. All Rights Reserved.